Pariyapuram is a hilly hamlet north of Tanur in Malapuram district of Kerala. The laterite hillock here houses an ancient cave that was developed and used by several generations of human beings over the ages. The megalithic people might have originally discovered it and made it their abode. There are similar megalithic laterite modified and cut caves in Anakara, Athavanad, Farook and Kandanasery all around Malabar. 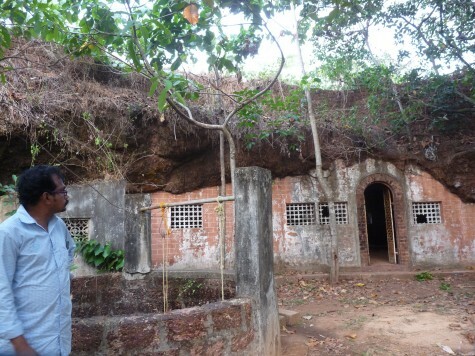 Pariyapuram Buddhist cave. In the 1930s Bhikshu Dharmaskand installed a new marble statue of the Buddha where an old demolished Buddha idol relic was said to be placed. This is the eastern entrance. Early April 2013. Compared to Kandanasery of Kovilan and Anakara caves on the Ponnunirathu hill near Edapal that are built by the stone age people and are small the natural caverns on laterite hillocks in Athavanad and in Pariyapuram are huge and was used by generations of people and still being appropriated by new sects and folds. While the Pariyapuram cave is popularly called the cave temple or Asram the Athavanad cave is called Chingali Mada. It could be a derivative of Chengal Mada (laterite cave) or Changam Mada (Sangha cave). The eastern entrance of Pariyapuram Buddhist cave. Originally a natural cavern on the western slope of a laterite hill. Artist Anirudha Raman at the entrance which is marked as Asram now. 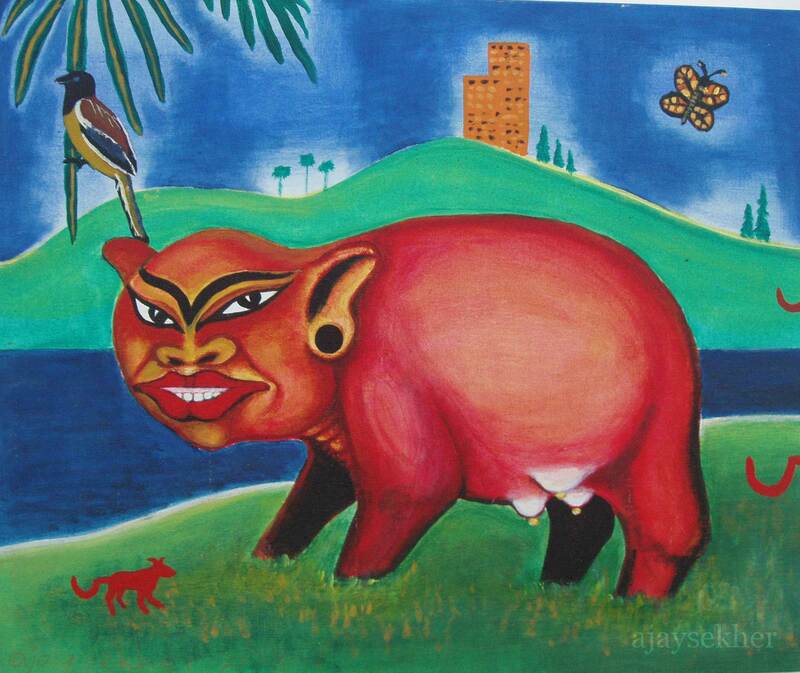 The place name Pariyapuram near Tanur is also interesting. Place names with the affix Puram have Buddhist antiquity as in Anuradhapuram or Srimulapuram. Pariyapuram could be originally called Periyapuram or the mega city. It could have degraded into a periphery or margin called Pariyamburam or Pariyappuram after the Hindutva take over in early middle ages. 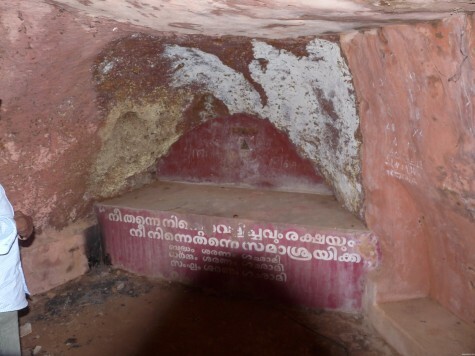 The carved niche in which the Buddha idol was installed by Bhikhu in 1935 according to Aandi Kutty master. “Be Your Own Light” the words of the enlightened one inscribed in Malayalam along with the Tri Saranas: Buddham, Sangham and Dhammam. The master of Malayalam dalit short fiction, C Ayyappan for example talks about Periyapurath goddesses who were expelled from the Hindu Savarna fold. A few miles south east at the juction of river Tuta and Perar there are seven goddesses who are considered sisters and the ones at Kanakar Kavu at Irimpiliyam on the northern banks of the confluence of the rivers are considered as expelled and ostracized goddesses who mixed themselves with the dalits. Even today the dalits are performing the rituals and Puja in Kanakar Kavu. The Kalakettu or Kalavela and Puram ritualistic annual festival of the Kavu are reminiscent of the Buddhist chariot and mascot festivals that are present in modified fashion throughout the south Indian peninsula. 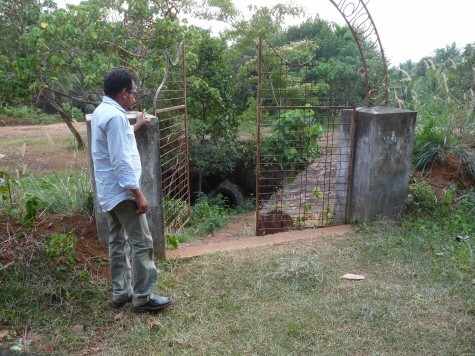 Aandi Kutty Master narrating the early 20th century saga of Pariyapuram and the Buddhist cave at his home in Pariyapuram. Early Apl 2013. Thanks to his family for good coffee and jack chips. In Pariyapuram near Tanur the elders remember a Buddha idol that was there in the cave at the beginning of the 20th century. It was in a demolished state, perhaps in the violent Hindu conquest. 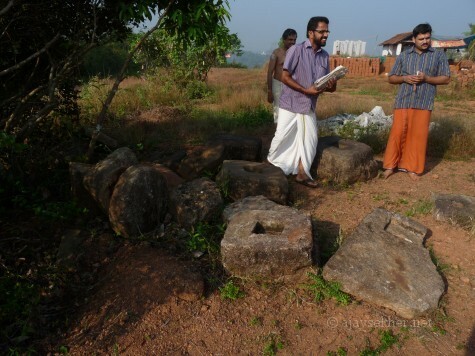 In early 1930s a few local Avarna and Tiya families established a school and Bhikshu Dharmaskand a close associate of Mitavadi C Krishnan and Mahabodhi Society and Buddha Mission of Calicut was invited to the school for an initiation meeting and the Bhikhu after seeing the ruined site of Chamana antiquity, renovated the cave and consecrated a new white marble sculpture of the enlightened one in the cave. 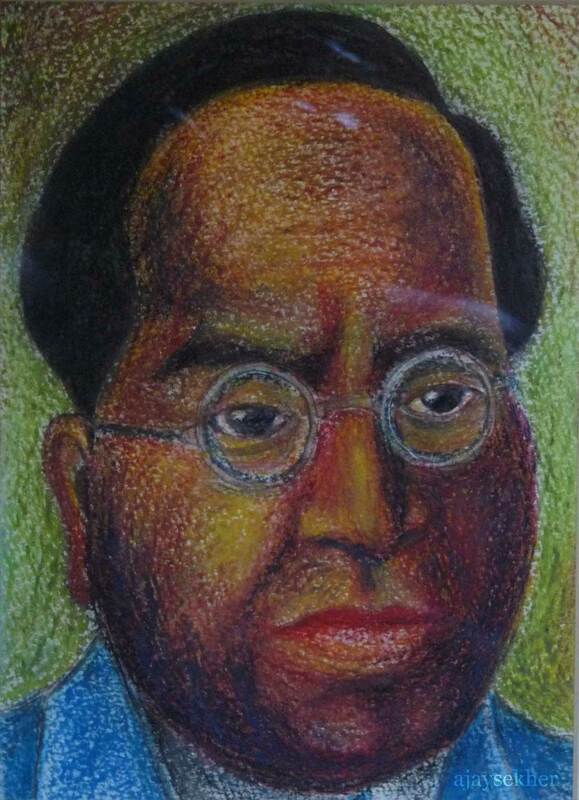 After his demise in the sixties or seventies it was taken into the school to be protected and is now missing. 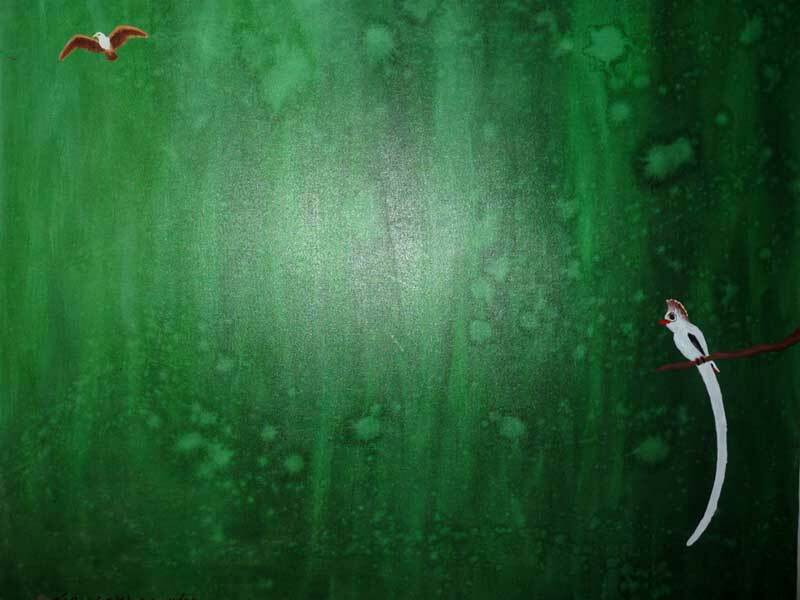 Rama-Lakshmana-Sita-Hanuman mural that has come up in the Pariyapuram Buddhist cave. 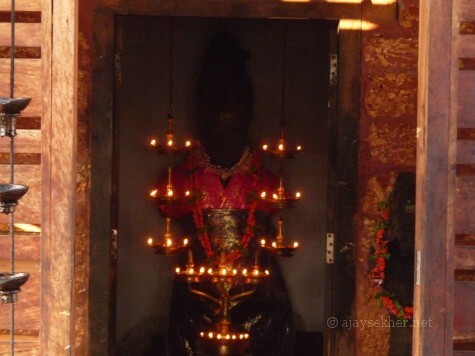 See Sita worshiping the Siva Linga. The VHP has made demands to acquire the site. It is interesting to note that on an adjacent hillock there is a Siva temple and a Math or Brahmanical monastery said to be established by Adi Sankara. 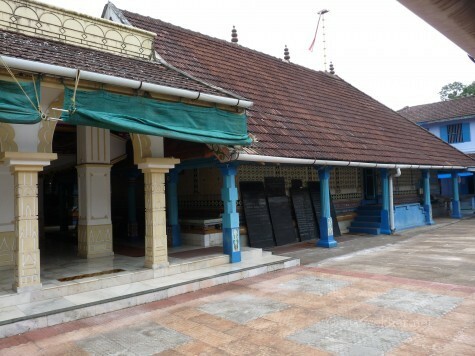 An Ayyappa temple is also there in Tanur. 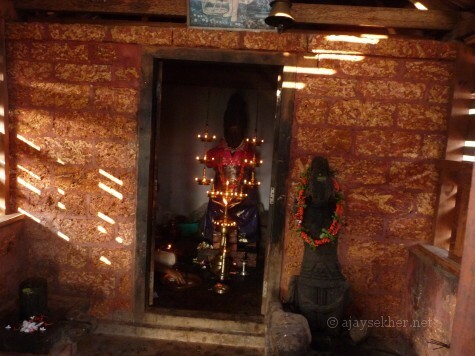 The Trikaikattu Siva temple could had been a Buddhist Vihara before Sankara, that is up to mid 8th century AD. Like Trikal or the sacred foot marks of the gurus the Amana also worshiped the sacred palm prints or hand marks of their masters. 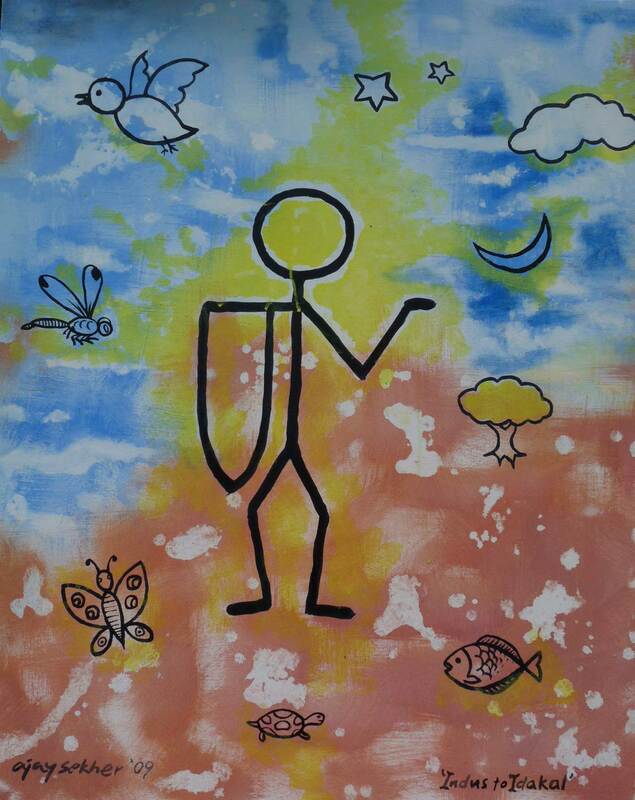 The place name Trikaikattu literally means the forest/grove of the sacred hand. It clearly echoes the past of relic worship that was popular in Buddhist stupas or Chaityas. It could be Sankara who defeated the Chamana monks in equivocation and expelled them and converted the Bauddha Pally into a Siva temple by consecrating a Linga in the Garbha Gruha or the sanctum sanctorum. 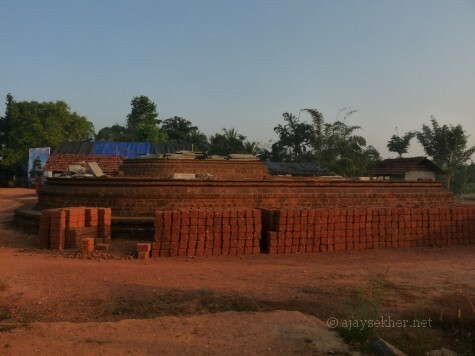 The demolished old Buddha idol that was said to be there till the 1930s could be the deposed icon of this ancient Vihara. There are also quite a few Chiras or huge laterite stone-cut and stepped ponds in the region. Such ancient ponds and place names including the Chira, Puram, Trikai etc. are Buddhist markers existing in linguistic parlance and toponyms. Folk etymology or Janata Niruktam of the people also reflect such non Vedic legacies related to the region. That is why the former untouchables or Avarna people who were casted away from current Savarna Hindu temples until the 1940s or 50s are able to relate to the idols of the Buddha and ancient caves to the Amana or Chamana monks. It is the Avarna who defend and worship recovered Buddha idols from the muddy ponds or fields in the viscinity of current Savarna temples, everywhere in Kerala, whether it is Kuttanad or Malabar. Neo Buddhism initiated by Avarna intellectuals and cultural activists like Sahodaran, Mitavadi, C V Kunjiraman and others in early 20th century was a strong and influential movement within Kerala renaissance. 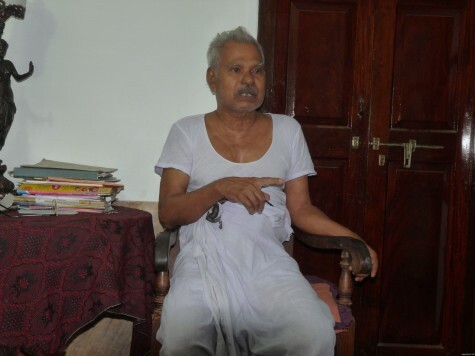 Mr Aandikuty master, and enlightened elder from the place and a retired teacher from the local school, remembers these days of social and cultural awakening in Malabar under the aegis of Mitavadi, Bhikshu Dharmaskand and Mahabodhi Society. 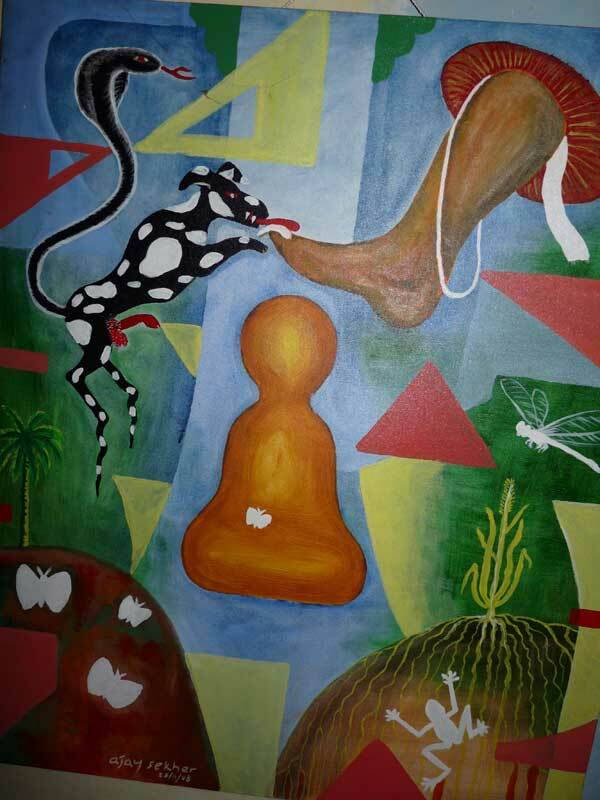 The dalitbahujan people found this neo Buddhist movement as a way of social transformation and improving the self in the tumultuous upheavals of renaissance Kerala in early 20th century. The ethical and non violent philosophy of inclusion and social democracy that originates from the early enlightened teachings of the Buddha helped the untouchable Avarnas who originally belonged to the Buddhist tradition in Kerala that was destroyed by Brahmanism, to regain their social mobility and human status in early 20th century. 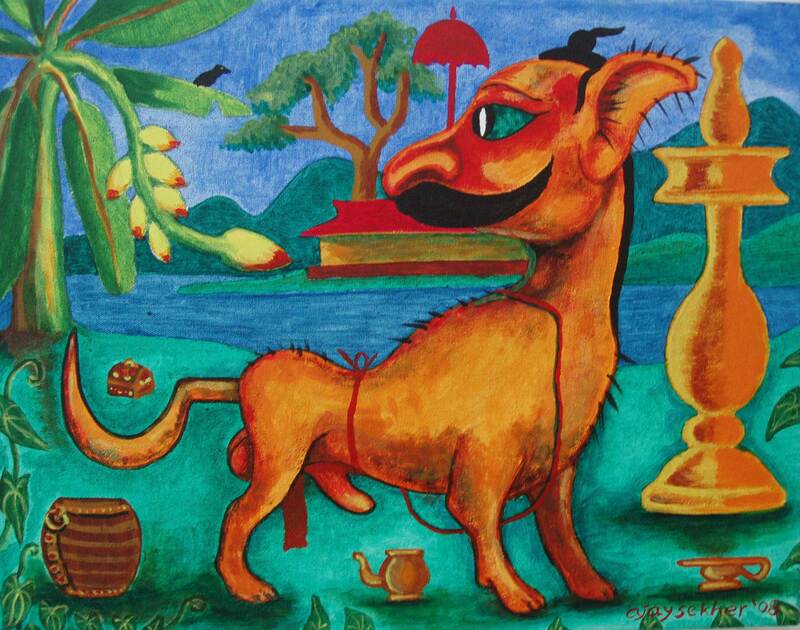 But unfortunately after the re-Hinduization period following the temple entry politics and republican rule the Avarna people have lost their political and historical awareness and memories and found cozy asylums in the so called greater fold of liberal Hinduism. 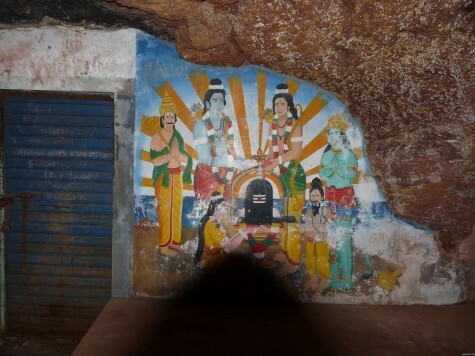 The RSS and the right wing Hindutva forces are now encroaching into the cave at Pariyapuram and there is already an enamel fresco depicting Rama, Lakshmana, Hanuman and Sita worshiping a Linga in the cave. It is only a few years old and interestingly depicts Sita as prostrating and fondling the phallus with her hands. The VHP has also recently made a plea to make this cave a Hindu pilgrim place. 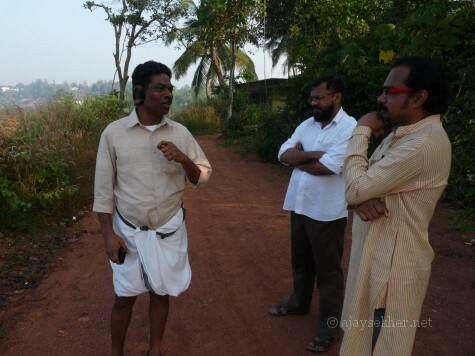 Considering the antiquity and the historical and socio cultural significance of the cave in the history of Kerala renaissance and the social transformations in Malabar the site must be protected and conserved by the state departments of culture and archeology. 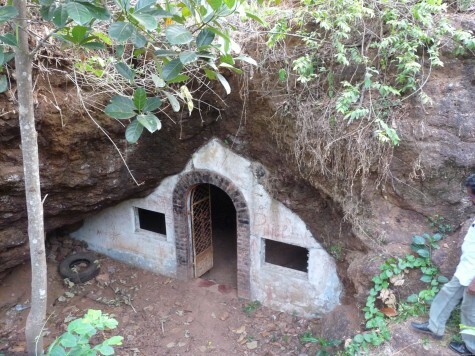 Similar laterite caverns and Munimadas found throughout Malabar also need the attention of the state and the civil society. Local bodies and people’s organizations must also show interest in the conservation of their eco-cultural heritage. It was actually the daughter of Bhikshu Dharmaskand, Mrs Karuna Peterson from Denmark who telephoned me after reading my web article on Mitavadi and Neo Buddhism in Kerala and informed me on Pariyapuram cave. Artist Anirudha Raman my friend and co-traveler also gathered information to locate the cave and we visited the place together in early April 2013. This entry was posted in Cultural Politics and tagged Bhikshu Dharmaskand, Buddhism in Malabar, Chamravattam and groves, cultural legacies of Malbar, Kavus of Kerala, Kutichira and Pallys, Mitavadi and Neo Buddhism in Kerala, Neo Buddhism in Malabar, Pariyaapuram in Tanur, Pariyapuram, Pariyapuram cave and Buddha idol, Ponnani Valiya Pally, sacred groves of Kerala, Tanur, Tozhuvanur, Trikaikattu Siva temple and Math in Tanur on April 20, 2013 by Ajay.